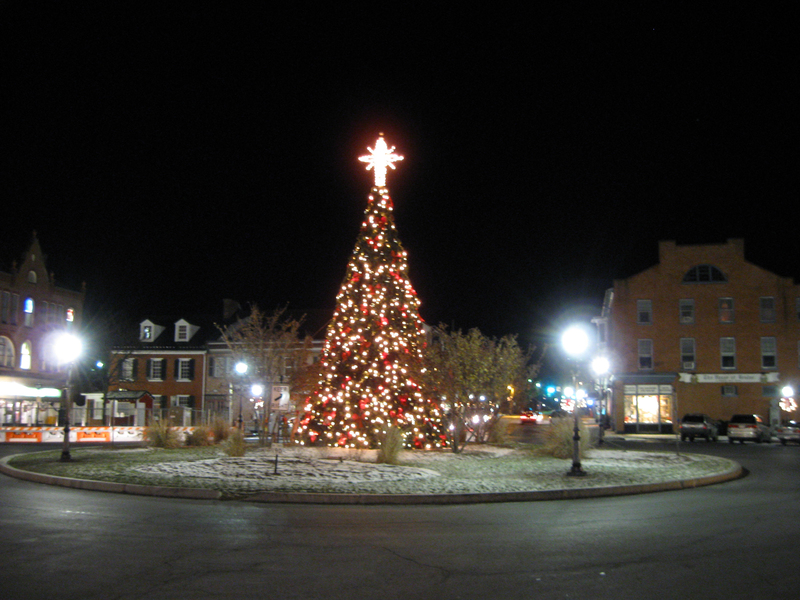 Lights on the Gettysburg Christmas Tree were officially lit on the Diamond last week. The Adams County Bank (the site of George Arnold’s store in 1863) is to the left of the tree. T&S Menswear (the site of Boyer’s Grocery store in 1863) is to the right of the tree. 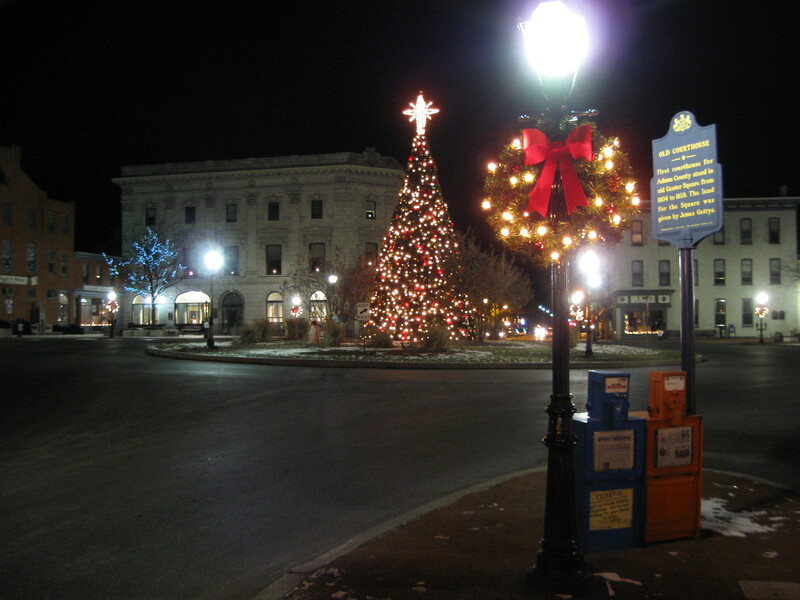 Chambersburg Street is the street between the two buildings. This view was taken facing southwest at approximately 6:00 AM on Monday, December 8, 2008. 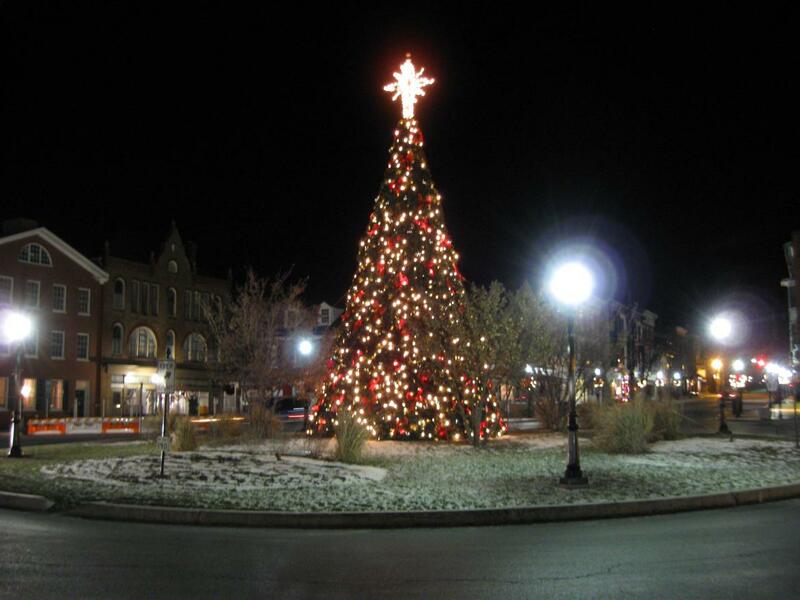 The Christmas Tree is up on the Diamond/Lincoln Square/Circle, and some of the buildings on the Diamond have also been decorated for Christmas. Wreaths with lights are also on display on the lamposts on the streets leading from the Diamond. 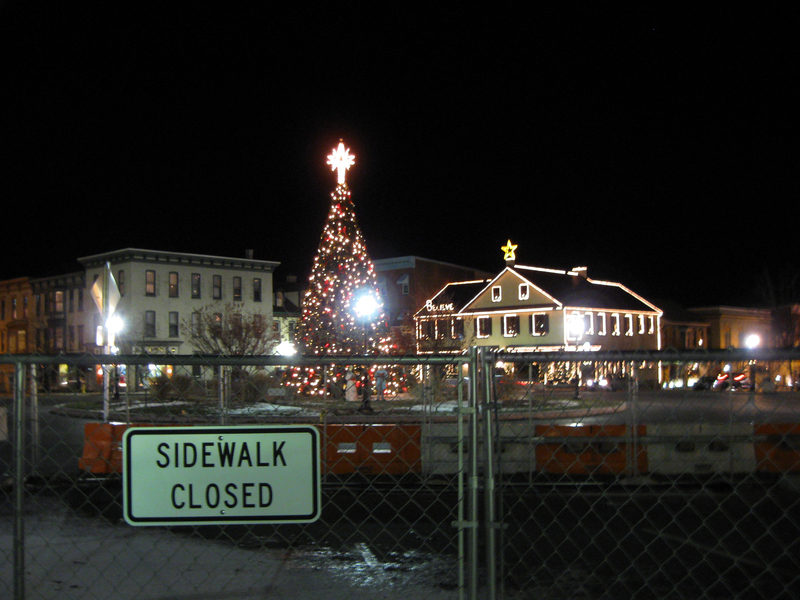 The Christmas Tree occupies the center of the Diamond which was the site of the original Adams County Courthouse from 1804-1859. The House of Bender is in the right background (John Lawrence Schick building in 1863). Baltimore Street is to the left of the J.L. Schick building. 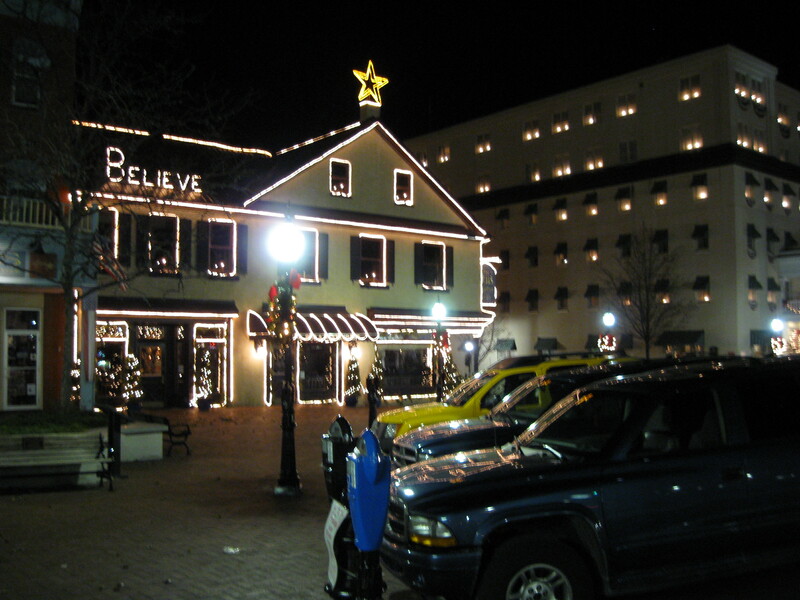 To the left of the tree is the Plaza Restaurant, and to the left of the restaurant is the 1863 home of Joel B. Danner. To the left of the Danner House is the Masonic Hall, which was the 1863 home of Robert Harper. This view was taken facing southeast at approximately 6:00 AM on Monday, December 8, 2008. 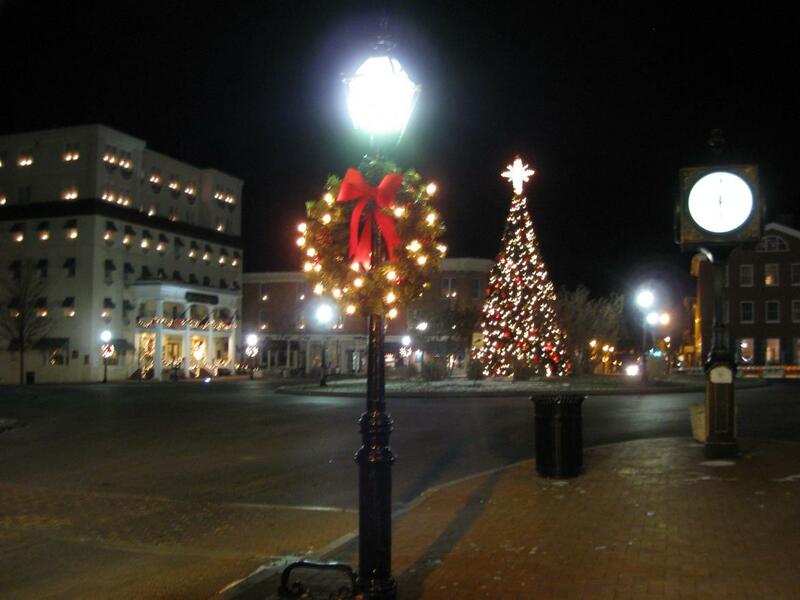 Lighted Wreaths also adorn the lamp posts on the Diamond. 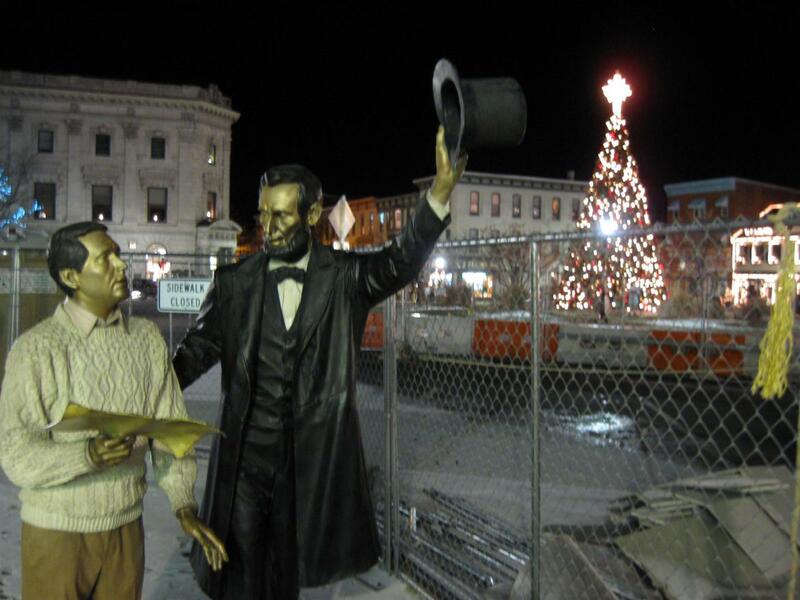 The Gettysburg Hotel is in the left background. The Wills House is on the far right, and York Street is to the left of the Wills House. This view was taken facing northeast at approximately 6:00 AM on Monday, December 8, 2008. 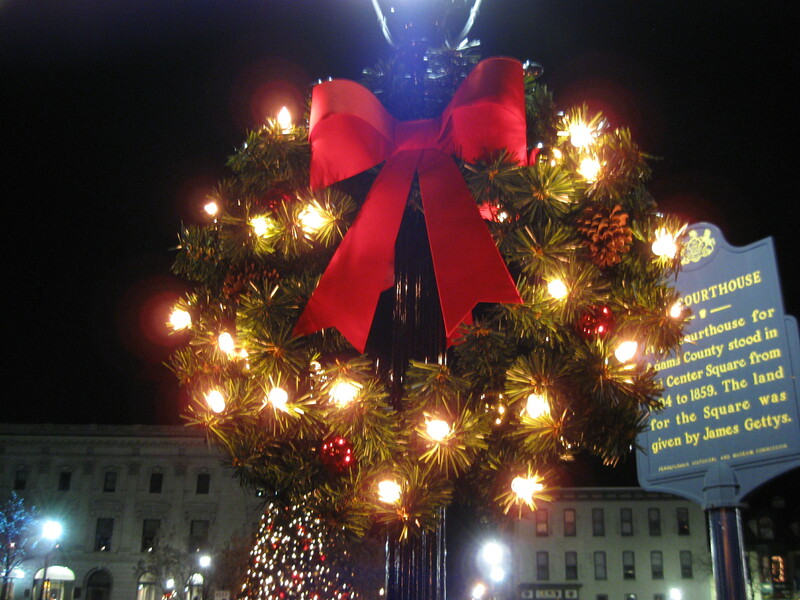 The wreaths are on each lamp post one block from the square, on both sides of Carlisle Street, York Street, Baltimore Street, and Chambersburg Street. This view was taken facing west at approximately 6:00 AM on Monday, December 8, 2008. 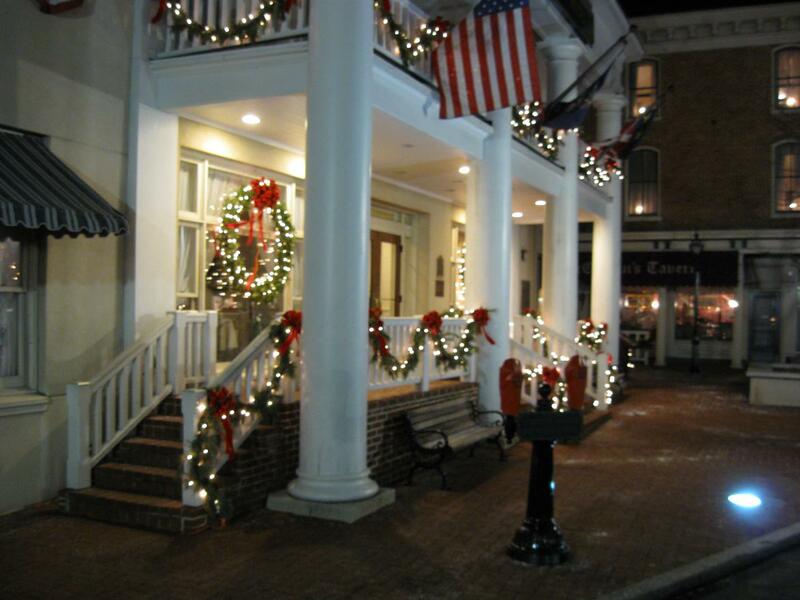 The Pub Restaurant on the left, and the bottom of the Gettysburg Hotel on the right have also been decorated for the holidays. Carlisle Street runs north between the buildings. This view was taken facing northwest at approximately 7:30 AM on Saturday, December 7, 2008. 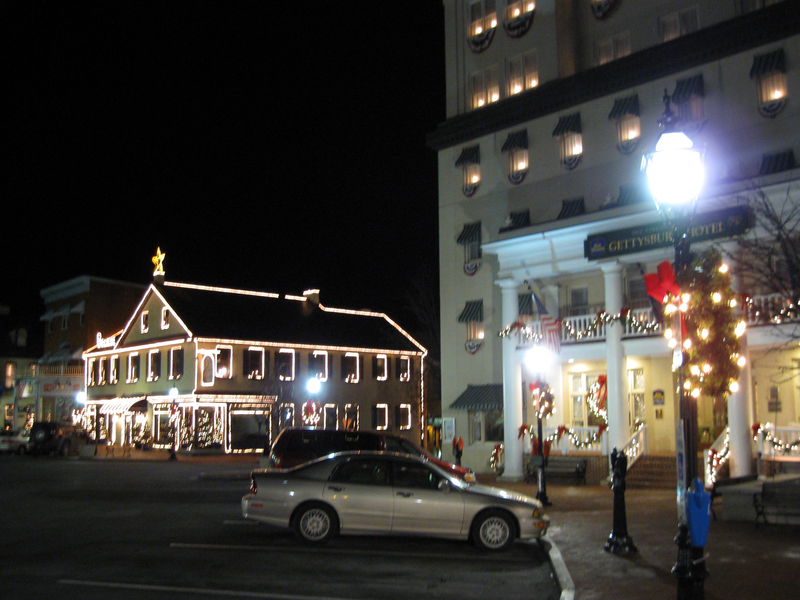 The Gettysburg Hotel sits on the site of what in 1863 was a much smaller McClellan House. This view was taken facing northeast at approximately 6:00 PM on Sunday, December 7, 2008. The Pub was competely rebuilt after a fire destroyed it in February, 2001. This view was taken facing northeast at approximately 6:00 PM on Sunday, December 7, 2008. 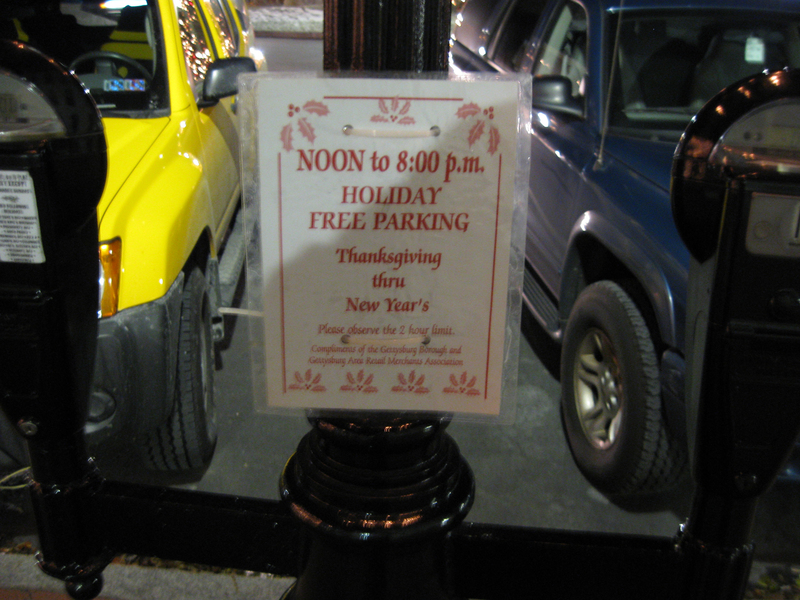 Free parking in Gettysburg through New Years. This view was taken facing southeast at approximately 6:00 PM on Sunday, December 7, 2008. However, the parking spaces, and the sidewalk near the Wills House are still closed for no apparent reason. This view was taken facing northwest at approximately 6:00 PM on Sunday, December 7, 2008. Perry Como on the left, is always dressed properly for the winter holidays. This view was taken facing northwest at approximately 6:00 PM on Sunday, December 7, 2008. The land on the Diamond was originally donated by borough founder James Gettys. The David Wills House is on the far left of this view. This view was taken facing southeast at approximately 8:00 AM on Saturday, December 7, 2008. Wills House’s sidewalk construction on July 21, 2008. Wills House started to be painted red on August 13, 2008. Red paint beginning to cover the north side of the Wills House on September 3, 2008. First coat of red paint completely covering the north side of the Wills House on September 4, 2008. Wills House needing a new manager on September 12, 2008. White stenciling appearing on the north side of the Wills House on October 14, 2008. Completion of the white stenciling on the north side of the Wills House on October 21, 2008. Stenciling, railing, steps, and shutters of the Wills House on October 31, 2008.